Update March 22, 2017: The Kickstarter for All Walls Must Fall is now live, as is the stylish new trailer above. How cool does that combat look? The new video really gives you a sense of how the music blends with the rhythmic gameplay. The electronic loops work with a procedural mixer, reacting to the action. The sample tracks on the All Walls Must Fall Kickstarter page are bloody good, too. The game has already raised a third or its modest 15,000 euro goal. Development of the game is already quite far along, but the developers basically need some money to keep the lights on. I’d say they deserve it. Original Story March 15, 2017: All Walls Must Fall sounds like an interesting prospect. 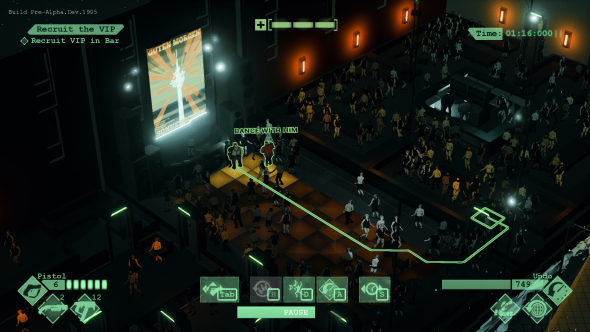 From ex-Yager developers who worked on Spec Ops: The Line and Dead Island 2 before it was cancelled, the tactics game takes inspiration from stuff like XCOM, Braid, Superhot, and Rez. The year is 2089 and the Cold War is still raging, the Berlin wall still stands, time travel has been invented, and people still like to let loose in garish nightclubs.Players command time travelling secret agents that have to stop the Cold War going nuclear in a single night. All Walls Must Fall has been in development over a year already, but the developers are struggling to keep the lights on. To keep the game alive, they’re looking for 15,000 Euros on Kickstarter. They just want to stay afloat, though more money being pledged would obviously be funnelled into the development of the game. If you decide to pledge next Wednesday, you’ll get access to the closed alpha so you can try it out for yourself. It’s looking really cool. If you want to find out more about it, check out our All Walls Must Fall making of.